The BeagleBone Black has been launched about a year ago, and this low cost ARM Linux board has become pretty popular with hobbyists, robotics courses at universities, and even people making products. The downside is that it has been difficult for CircuitCo, the manufacturer, to keep producing enough boards to match the demand while keeping the price at a low $45 with very little margin, and there are currently about 150,000 boards on distributor back-orders. To improve availability, Beagleboard.org has announced Revision C of the BeagleBone Black with a 4 GB eMMC, which may be easier to source over time than the original 2 GB eMMC, and that will sell for about $5 to $15 more than the previous version, or between $50 and $60. The rest of the hardware specifications remain identical. There’s also a change on the software side, as the board will be pre-loaded with Debian, instead of Angstrom, in order to lower the learning curve for novices. To further improve availability of the board, Beagleboard.org has also partnered with Element14, through their subsidiary Embest, in order to manufacture BeagleBone Black clones via a newly introduced BeagleBoard Compliant logo program. Embest has been manufacturing BeagleBone Black clones for the Chinese market for a while. You can see the clone and original side by side on the picture above. I’d assume the new Element14 BeagleBone Black will have the BeagleBoard logo after their partnership with the community. 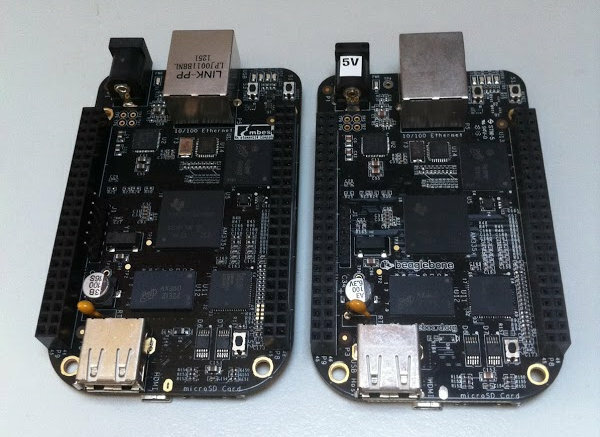 Manufacturing of the BeagleBone Black revision B will stop on May 5, and it’s not clear if it is still possible to order the $45 version of the board. BeagleBone Black Rev C is already available for pre-order online via stores such as Hackertronics’s Makertronic store ($55), Sparkfun ($55), RP Electronics ($57.78), and Tigal (47.50 Euros + VAT). Shipment is expected as early as April 29. I can also see a BeagleBone Black is currently available on Element14 for $45 but with the status “awaiting delivery” of stock, so they may still take orders for the Rev B version.